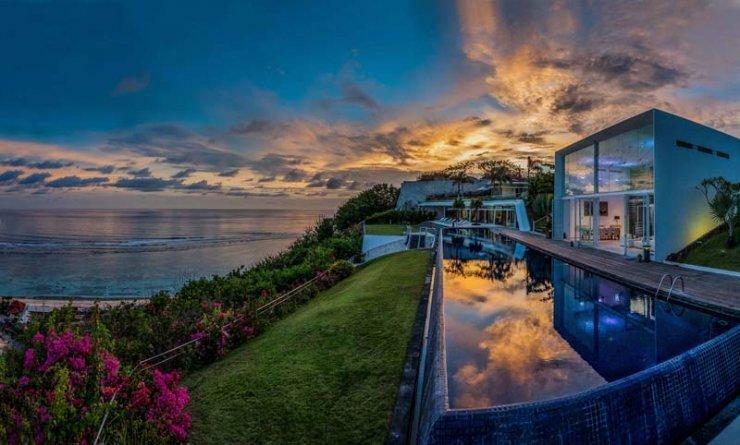 Uluwatu Villa 3101 rests in blissful seclusion upon 1.5 hectares (roughly 4 acres) of prime, cliff top land, 170 metres above the rolling surf of the Indian Ocean on the southernmost tip of the island of Bali facing south. 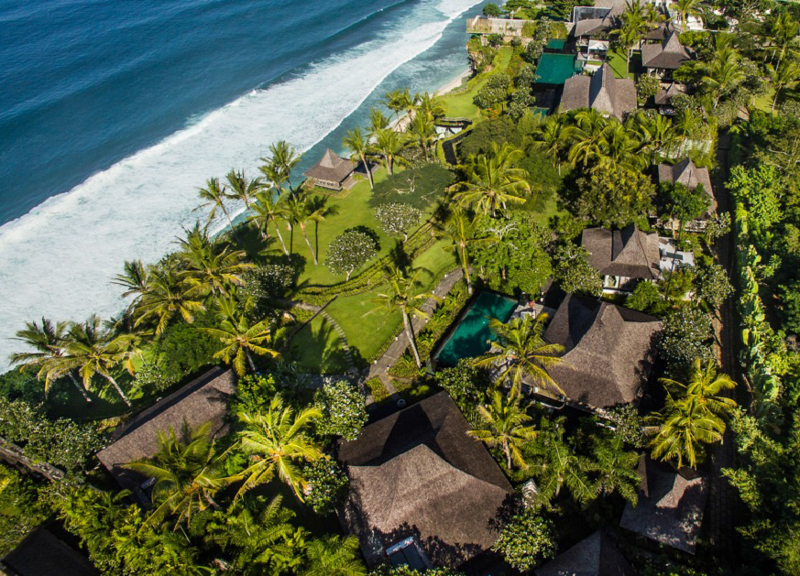 The Estate is located near the famous Uluwatu temple, and is immediately adjacent to the Bvlgari Hotel and Resort, overlooking Selonding Beach below. Villa 3101 offers numerous relaxation areas, so guests will always find a private spot for peace and quiet. In fact, a large family or group of people could have stay at the Estate and still lose each other within its depths. Cool sea breezes and the rhythmic sound of the waves combine to create a close to nature experience. 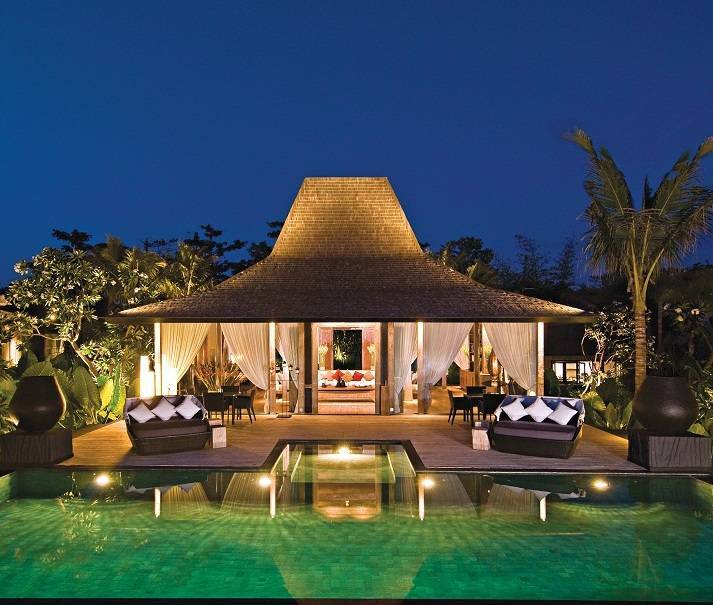 The architect of this astounding Villa is Cheong Yew Kuan, one of Asia’s leading resort and luxury villa architects, and the principal designer is Jasmine Saunders-Davies, who together with her husband owns the villa. 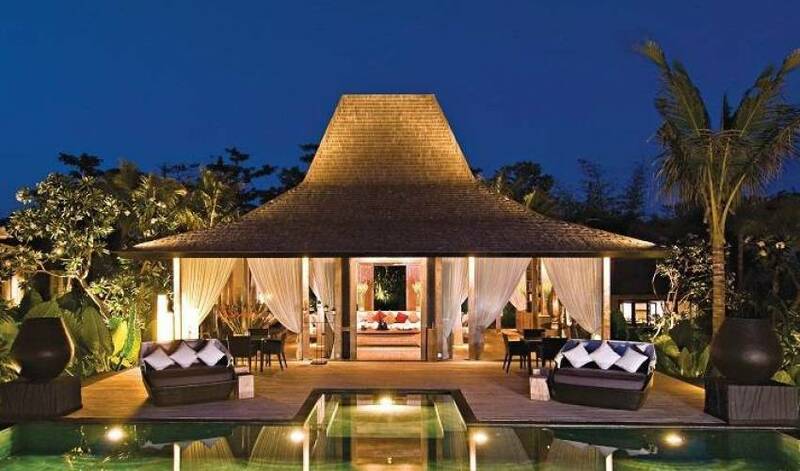 The architecture blends Javanese tradition with contemporary design and European influences. The buildings incorporate an abundance of recycled teak wood in the form of floorboards, doors and elaborately-carved ‘pondopo’ centrepieces. This is complemented by ironwood shingle roofs and natural stone finishes. The front and side wall panels have been replaced with ceiling to floor glass, giving the buildings a contemporary feel, and allowing more natural light to enter. The Estate is supported by a carefully selected team of highly trained staff including chefs, housekeepers, gardeners and security guards. 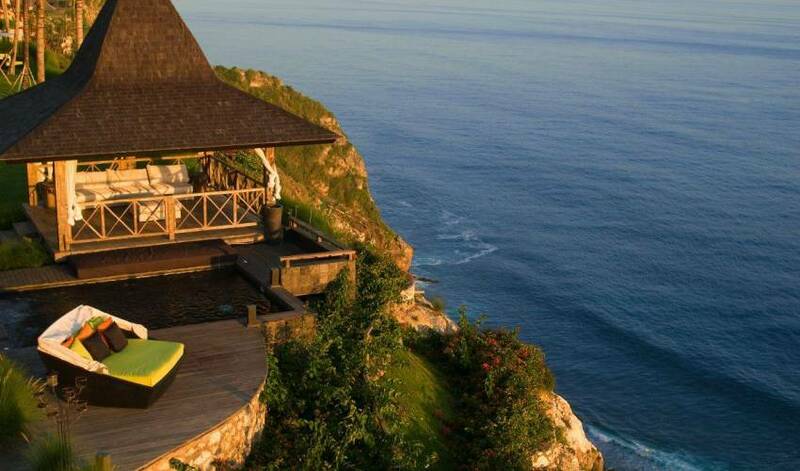 Uluwatu Villa 3101 welcomes children of all ages, cots and high chairs can be provided. Baby-sitting services, together with the facilities of a car, a driver, a tour guide and extra staff are also available on request. Security guards are on duty day and night. 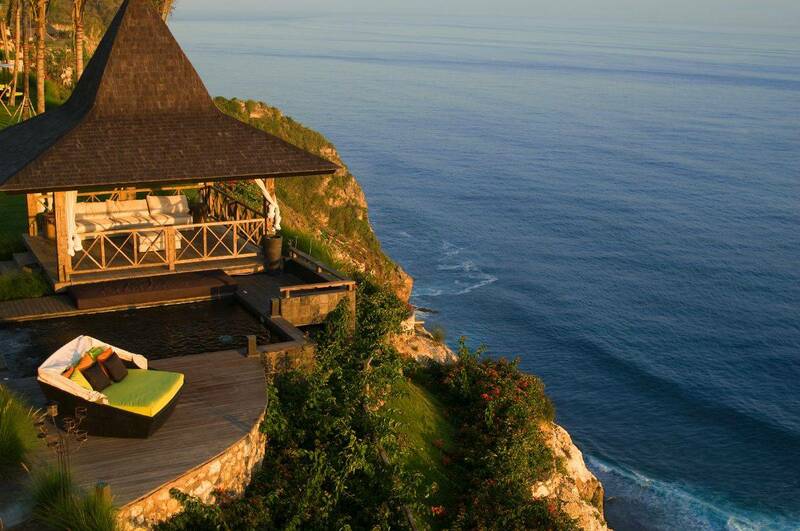 Uluwatu Villa 3101 is the epitome of heritage and environmental conservation. Saved from destruction, the antique joglos from Kudus in Central Java were transported to Bali and carefully restored to preserve their unique characters and authentic features, such as the distinctive funnel-shaped roofs and elaborately hand-carved ceiling centre-pieces, panels and beams, which makes them unlike any other Bali villas. To minimise our environmental impact, we have ensured full use of reclaimed teak throughout the estate,where ever possible, from the roofs and walls, to the flooring and furniture. We utilise the latest environmental technologies and a range of eco-friendly practices. Additionally, we recognise the need to positively contribute to the local community in which we operate, by employing our staff from the surrounding area. Our philosophy is simple - to be the best of the Bali luxury villas by harnessing Indonesia's great cultural heritage, amazing natural assets and charming Balinese hospitality to create a new concept in luxury holidays. We offer you the comforts and privacy unique to Bali luxury villas, in one of the most enchanting holiday destinations in the world, to share exclusively with your family and friends. 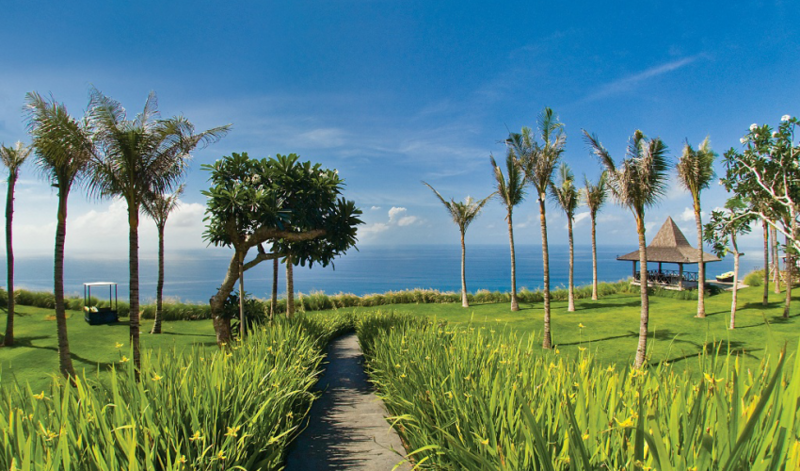 Uluwatu Villa 3101 is laid out as two clusters, each featuring three, self-contained, Bali luxury villas. 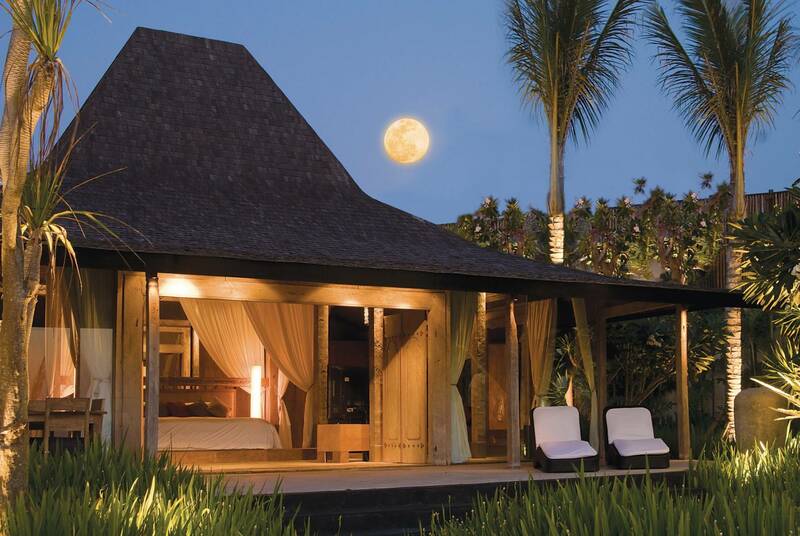 Each of these Bali villas presents a bedroom with an en-suite bathroom. The estate is available for two parties of six persons or as a single residence of six bedrooms accommodating up to 12 guests. Sitting higher and closer to the edge of the cliff, Cluster 2 features two joglos, the Maharaja suite and the two-bedroom Sanjaya suite, each with large private plunge pools. The suites are situated on both sides of a second infinity-edge swimming pool, which leads up to the covered terrace in front of a grand living and dining pavilion. Each suite is exclusively designed and decorated to enhance its individual character. Every bedroom features a majestic king-sized bed set within thick wooden central pillars under a beautifully and intricately carved pondopo or multi-tiered ceiling centre-piece. The Sultan master suite is the largest of the bedroom suites, as well as being the most unique and undoubtedly one of the very best that you will find among Bali luxury villas. Sultan is complemented by floor-to-ceiling glass panels in the front and sides of the building, designed to let in more light and give a contemporary feel to the sprawling interior. Its original 12-panel carved doors open up to a wide, covered verandah, where you can enjoy alfresco dining or just relax on the lounge beds, soaking up the stunning view of the sea. The oversized king bed is set within a cocoon of wooden columns and netting and topped with beautifully and ornately carved centre-pieces consisting of many tiers, making you want to laze in bed all day. The bed linen is Egyptian cotton of the highest quality and thread count. Furnished to the highest levels of comfort with a mixture of ancient surroundings and the best comforts the 21st century has to offer, the simple tones follow the natural hues of the wood. Colour is added however through the clever use of Jim Thompson Thai silk pillows and bed coverings, adding a touch of opulent splendour to the sleeping area. The lavish, air-conditioned bathroom features separate ‘his and hers' washbasins resting upon thick wooden vanity units and an all-embracing rainshower fully decorated with East Timorese white river pebbles, combined with old teak wood, incomparable with other Bali villas. Beyond its rear glass walls and door is lush private water garden with an oversized bathtub, complete with an overhead canopy, ‘floating' in the middle of a pond with a relaxation pavilion to one side. Indeed, the Sultan's outdoor bathroom is probably the most romantic bathroom that you will ever find among Bali luxury villas Sultan suite is well appointed with all the amenities that you would expect from Bali luxury villas including a desk, armchair, spacious 12-panel built-in wardrobe, electronic safe, mini bar, coffee and tea facilities, sound system with iPod connections, DVD player and flat screen plasma TV. Majapahit lies on the eastern end of the property and is situated closest to the edge of the cliff. The picture perfect view of the azure blue sea and horizon framed by antique doors, visible from inside the suite, makes breakfast in bed simply irresistible, and is a rare feature within Bali luxury villas. The signature Majapahit bed is enhanced with contrasting black lattice panels at its head and foot, which lends a more contemporary feel to the suite. The Majapahit's bathroom features a 15-cm-thick, single piece of old teak wood in its natural form and shape, on which sits a sink carved entirely out of a single piece of natural river rock. Yet another feature that makes Villa 3101 stand out from Bali luxury villas. A large black terrazzo bathtub, lined with black river stones from Sumatra, looks out from behind a glass wall over the cliff to the sea. The smallest but most ornately decorated of the suites in Estate 1, the Keraton features a rare and unique double roof with intricately carved wall panels. Set a little further back than the other suites, the Keraton offers a wonderful view of the estate with its magnificent landscaped gardens against the backdrop of the ocean. Keraton is tastefully furnished with reclaimed wood furniture and antique carvings in the traditional Toraja motif from Sulawesi, which adds an ethnic accent to its simple but sophisticated interior, making it one of the top Bali luxury villas. The bathroom walls and ceiling are fully covered with a lattice of antique Javanese-style flower carvings with concealed lighting behind, which casts beautiful shadows all around when lit up at night. Encased on both sides by glass, the double bathtub looks out into a verdant garden with a Balinese style outdoor shower - yet another stunning and rare feature among Bali Luxury Villas. The magnificent and palatial suite, known as Maharaja, is situated almost in the centre of the grounds, at the highest point of Khayangan, affording stunning views over the cliff-top pavilion and the sea below, as well as the lush gardens of this remarkable estate of Bali luxury villas. The antique doors at the front open up to a private verandah and a plunge pool. The most dramatic aspect of this suite is undoubtedly its spacious bathroom enclosed by a floor-to-ceiling glass wall, and highlighted by a double-sized Jacuzzi, a large rainshower and of course double vanities, all overlooking the majestic Indian Ocean. At the back of the suite is a delightful outdoor bath, similar to that of the Sultan suite, featuring a pond with a ‘floating' terrazzo bath in the middle, and also a private pavilion for lounging in privacy. The Sanjaya Suite sits on the western end of this wonderful Bali villas estate, and comprises two separate bedrooms, with a large bathroom in the middle. This suite, which also has a private verandah and a plunge pool overlooking the ocean, is ideal for families with young children, or for those who wish to stay close together. Both bedrooms are decorated in similarly grand style, with king-sized beds built into the central pillars of the joglos. A doorway in the middle of the suite opens up to the terrace and landscaped garden in front of the second dining and living pavilion. 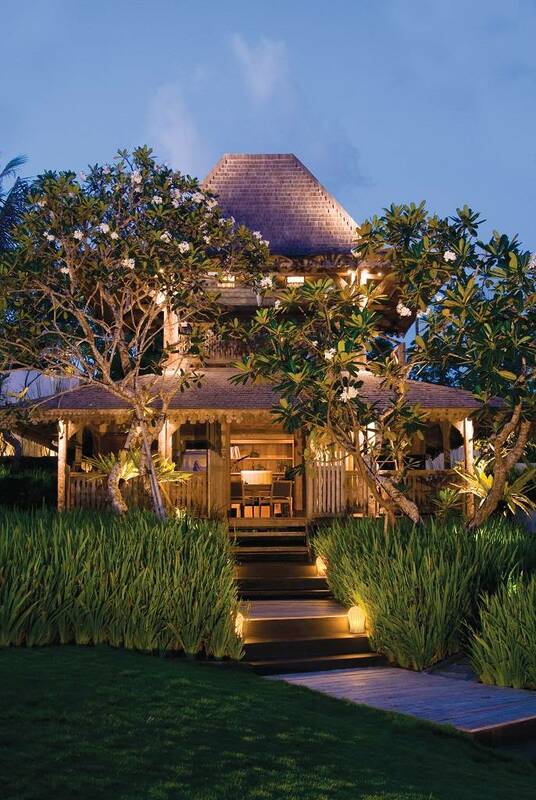 The living and dining pavilion in Cluster 1 is the largest and oldest of the hand-crafted joglos, created over 150 years ago in Central Java, and therefore quite unique in the world of Bali luxury villas. The most striking feature is its towering core of four intricately and exquisitely carved pillars, showcasing traditional patterns and flowers. The pavilion is immaculately furnished with ultra comfortable lounge sofas and chairs, a large coffee table, a minimalist console and a rustic dining table for 12, all custom-made from reclaimed teakwood. White muslin cotton drapes fall languidly between the central pillars, old teakwood floorboards are dressed with rugs in contemporary motifs, and the muted colour theme follows the warm hue of the natural timber. Our resident Spanish chef is at hand to prepare personalised menus for your pleasure, 24 hours a day. He will create an array of memorable dining experiences especially for you, whenever and wherever you fancy, anywhere on the estate or even to complement your excursions outside the estate. One Chefs: trained in local & international cuisine and in charge of the market shopping and preparation of guest meals. Four Gardeners & Pool Attendants: work discreetly in maintaining the landscape and the pool without disturbing the guests. Two Maintenance Personnel: in charge of engineering and general maintenance of the property. Set in a magnificent tropical garden, the Estate comprises of a cluster of traditional, antique, wooden Javanese houses, known as ‘Joglos’, which have been collected by the owners of Villa 3101 and saved from destruction. The Joglos, with their distinctive funnel-shaped roofs, have been carefully grouped in a semi-circle, echoing the feeling of a traditional Javanese village. Each is blessed with stunning ocean views, while skillful landscaping enhances the ambience and adds to the privacy. The Estate currently provides luxury accommodation for up to six persons in three, self-contained, fully air-conditioned bedrooms, complete with en-suite bathrooms. 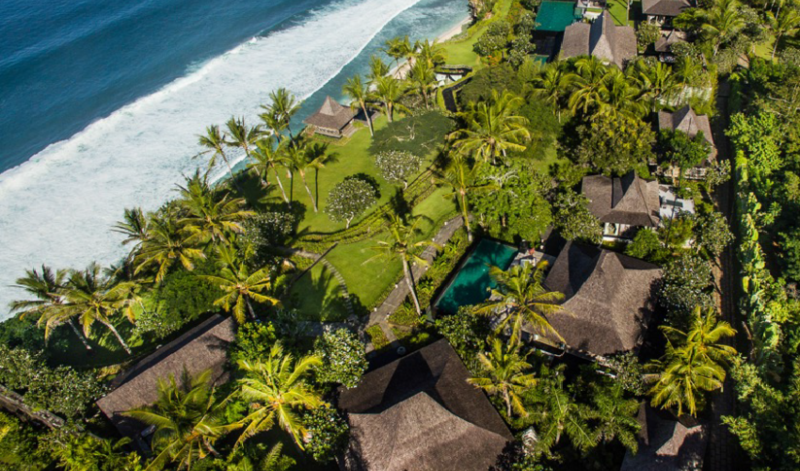 The focal point of the property is the splendid, hand-carved, century-old Joglo that serves as the main living and dining room, situated beside a 12-metre swimming pool. 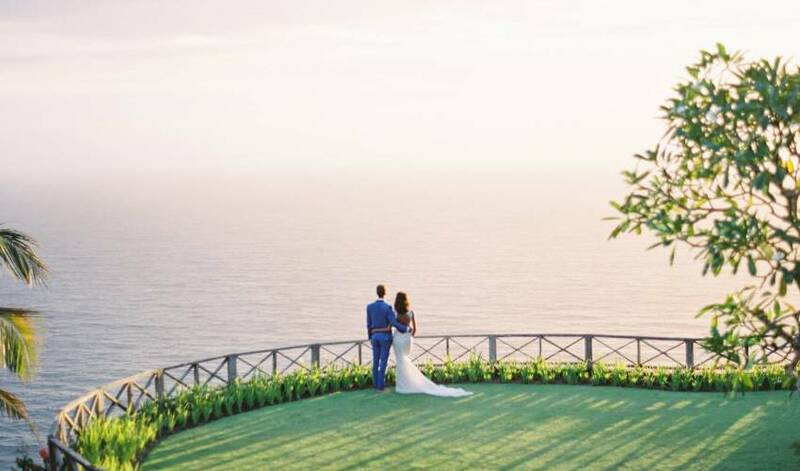 There is also a private office, a magnificent clifftop spa complex, known as the Seventh Heaven Spa, a clifftop pavilion, a tennis court and a well-equipped gym. Phase two of the project will introduce three more bedrooms and another pool. The interiors reflect the travels and passions of the owners, who invite guests to share and celebrate the rich heritage of Indonesia through an eclectic collection of Indonesian antiques, artifacts and artwork. At the estate, tropical island living meets metropolitan convenience, with state-of-the-art entertainment and communication facilities, together with all the comforts and service you would expect from a luxury boutique hotel. At 3101 Estate, tropical island living meets metropolitan convenience, bringing you all the facilities and services that can only be found in Bali luxury villas or within a Bali luxury resort. Villa 3101 is a fully self-contained private estate. 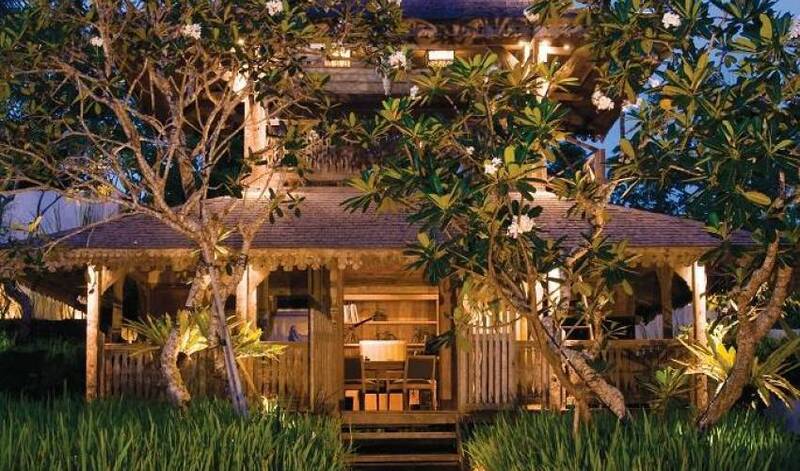 Uluwatu Villa 3101 boasts a dining service with a wonderful array of international dishes. Many Western meals are available, but we recommend you to try some of the local Balinese dishes for a unique cultural experience! Dinner parties and small functions can all be catered for within the villa for group of maximum 12 guests - please ask the chef or manager for more details at any time of the day, whether you are requesting breakfast, lunch, dinner, or snacks. For your convenience, as with all charges, food & beverage charges will be billed to your final account and payable in total upon checkout. Please ask your manager if you wish to check your daily expenses. Food items are charged at cost price plus a 30% service charge. (Staff will present receipts as proof of purchase and add to your final bill). Drinks have set prices. If you prefer to do your own cooking, please do not hesitate to make use of the kitchen facilities yourself. We encourage you to consider Uluwatu Villa 3101 a home during your stay. Uluwatu Villa 3101 has a stock of soft drinks, beers, spirits, wines and champagnes. All beverages are charged per drink that you order, except for wine which is charged per bottle. Please also ask the staff if you have any special beverage orders and they will accommodate your needs. Special items that need to be purchased separately will be purchased and billed to you at cost plus 30%. This exclusive Bali villa spa, encased with floor-to-ceiling glass, and beautifully finished in reclaimed teak and East Timorese white river pebbles, is unique in its offering of the full facilities of a commercial spa, including an outdoor plunge pool, indoor Jacuzzi, Vichy shower, steam room, wet and dry massage areas, and manicure, pedicure and cream bath stations, all for your own private use. Our resident professional therapists are at hand to pamper you with a complete range of signature treatments, based on traditional Asian health and beauty remedies, to invigorate your body and mind. Our treatments use 100% natural oils and local herbs and plants grown and blended exclusively for our spa. Uluwatu Villa 3101's tropical wedding caterers will delight you with their stylish, artistic expression.The freshest, most flavoursome ingredients are artfully composed and then presented with flair and finesse, while guests are looked after with gracious, friendly, professional service. The wedding banquet may be a sumptuous four-course dinner, a cliff top barbeque of fresh lobster and seafood, or an enticing Balinese feast of local delicacies such as spiced, minced fish wrapped in banana leaf and grilled saté garnished with peanut sauce. This will be further enriched by a colourful tailor-made tapestry of flowers, linens, candles, ice sculptures, musicians, fire-dancers and Balinese dance troupes, against a backdrop of natural tropical décor. Magnificent tropical wedding flower arrangements might include elaborate two-toned heliconias and sweet smelling ‘setiap malam', complemented by carpets of rose petals, Meduri flower curtains threaded with sweet scented wildflowers, together with bamboo archways of trailing palm fronds, unbelievable ice sculptures, flaming torches, fire-bowls and floating candles. The Balinese are masters of pomp and ceremony. You only have to witness a few of their lavish Hindu festivals and celebrations, enhanced by their clever use of natural materials such as bamboo, palm leaves, flowers and fruit, to get an idea of the potential that Villa 3101 has to offer. Every bride wants to look beautiful on her wedding day, a full range of professional hair and make up services will be made available for you and your attendants. Specialised bridal boutiques present exquisite gift items and a wide selection of wedding dresses and men's attire in a range of sizes, for the bride, groom, family and guests. Styles include designer labels, and gifts include sophisticated souvenir items. Alternatively, you and your guests may be dressed in traditional Balinese costume. As bride and groom you can opt to be wrapped in resplendent gold and red cloth, with the bride wearing an ornate golden headdress garnished with jasmine flowers and believed to represent the rays of the sun. Finally, staying at the very best of Bali villas you can enjoy a luxurious honeymoon at 3101 Estate, sleeping in a traditional, wooden Javanese house, known as a ‘Joglo', which was once the home of an aristocrat. At Villa 3101, tropical island living meets metropolitan convenience, with state-of-the-art entertainment and communication facilities, together with all the comforts and service you would expect from a luxury Bali resort Yet these unique joglo buildings still echo the feeling of a bygone era. As bride and groom, you will surely stay in one of Villa 3101's honeymoon suites, such as the Sultan or Maharaja, which are extra sumptuous. Here, the oversized beds, with their tall antique pillars, are swathed in flowing white drapes, perfect for a bride and groom. 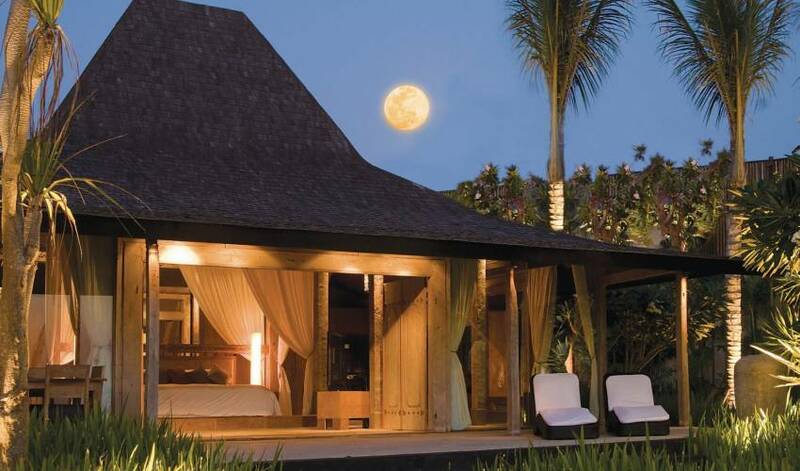 These presidential honeymoon suites also feature the most romantic outdoor bathrooms that you will find anywhere on the island of Bali, each set within a private water garden, complete with waterfall and a dreamy bathtub that appears to float upon a clear ornamental pond. 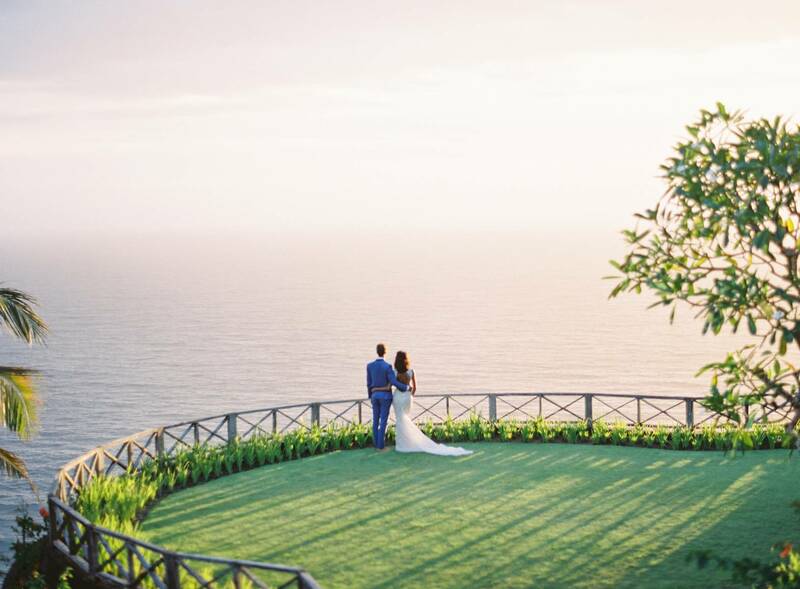 An Uluwatu Villa 3101 tropical wedding will make your dream become a reality.